Project Sekong 2014: We don’t pound a tent peg or build a fire until the camp is cleared of UXO. First things first! 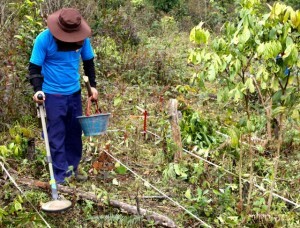 Before disturbing the ground or building a fire at our new campsite the deminers must first search for unexploded ordnance. As a reminder of how essential this step is, a day after establishing our camp the team found thirteen cluster bomblets in the adjacent forest. Yesterday when the trucks pulled into this site and the team offloaded all our gear, there wasn’t much that we could do until the deminers first checked the site for unexploded ordnance. We were told that a construction company had previously used the site, but we would never trust that another organization had properly searched for ordnance. Cluster bomblets that fall through triple canopy rain forest may land too softly to detonate. Bomblets that land in the mud may also fail to detonate but drive themselves a foot or more into the muck. In the dry season that mud hardens and the bomblet will be hidden underground, often in prime agricultural soil. 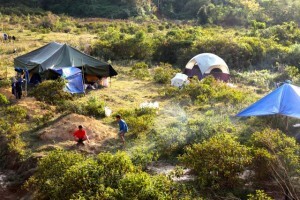 As we set up camp, we need to drive tent pegs deep into the ground. 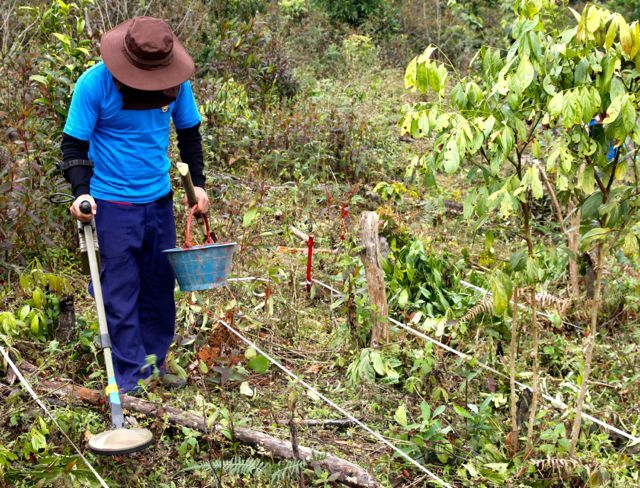 We need to dig rubbish pits and drainage ditches, both tasks that require us to hack with hoes and dig with shovels— dangerous work if ordnance is underfoot, so it should never be commenced before our deminers run their metal detectors over the site. Before we build a light a fire for cooking or warmth, we need to search under the fire ring for ordnance. The heat from a campfire will penetrate the soil and if a rocket, mortar, landmine or bomb is beneath the fire the hidden object could explode. I’ve known families who cooked over the same spot for months, then moved their fire ring just a few inches and suffered injury when their next fire exploded in their faces. Last year our main tent was brand new and, in what might be a cultural universal, not one Lao deminer showed the slightest interest in locating printed directions. I recall lengthy debate, several false starts and slow progress. This year the same tent looks to have been used hard while I was gone and the guys erecting it work silently, each assuming a well-practiced role. While the guys on this year’s team look younger than the deminers I’ve hired in the past, there’s little grass growing under their feet; they’ve obviously worked together before and know one another’s strengths and weaknesses. While some of the team carried provisions to the kitchen and others carried bedding and personal belongings to the tent, two men unloaded our generator and fired it up. That piece of equipment is essential to our project since we are working in a region with no electrical power and every day the deminers must recharge the batteries in their metal detectors. After all the heavy lifting was completed most of the guys grabbed their towels and headed to a nearby spring. It was chilly (high for the day, not much above 50 degrees F) but it’s a foundation of Lao culture that if you’ve broken a sweat or got dusty trying you need a full bath, cold air be damned. All but one member of our team arrived at dinner with wet hair, clean ears and a shiny face but all were served a hearty dinner of sticky rice and cabbage stew.